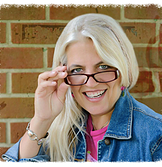 P.J.Boox was founded by award-winning author and illustrator, Patti Brassard Jefferson in the summer of 2015. As an independent author who published her first book with an indie publisher and Kickstarter funding, Jefferson relates to the challenges and struggles of non-traditionally published authors. Through her experience as a board member of the Florida Authors and Publishers Association, Jefferson began to connect with other indie authors and see the need for avenues to help. 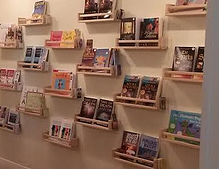 She opened the Gulf Coast Bookstore with a partner in April of 2015 and was immediately inundated with responses from authors around the world. It was then that the idea of P.J. Boox was born... a large-scale bookstore just for the little guys. Hi Patti. Let’s start with you. What’s your background and how did you come to set up a bookstore? My background is actually in media arts and advertising. It seems that I have always chosen the creative path career-wise: I have owned my own graphic design business out of college, worked for an independent music label as a marketing director, opened an paint-it-yourself pottery studio with my mom, owned an art gallery in the Keys and then decided to finally follow a passion and released my first children's book in 2013. This industry can be pretty complex and frustrating but the rewards are so worth it. To date, I have written 2 children's books and illustrated a total of 9 with 3 more coming out before the end of the year. When I believe in something I really latch on! Where did the concept of a bookstore exclusively for indies come from? Being an indie author myself-- AND having a regular job (illustrator) -- AND handling my book marketing -- AND trying to squeeze in time to write the next book -- the usual stuff that indie authors deal with everyday -- made me realize that none of us have a lot of time to get our books into retail locations. And , even when we do get in a bookstore, more often than not we are buried spine out between hundreds or even hundreds of thousands of other books and frequently give up 40% of the income on each sale. The traditional bookstore model didn't work for me and I figured I couldn't be the only one. I experimented a bit to test my theory and opened a small local indie author bookstore with a business partner and fellow indie author, Tim Jacobs, in April 2015. 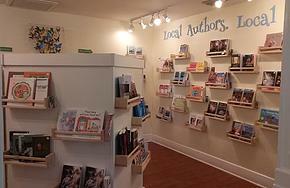 It currently houses 54 local authors and we have a decent waiting list for space. The response we got from that venture was overwhelming and so I was more convinced that indie authors needed something like P.J. Boox. What’s in it for the authors? All of our books are displayed front facing. Despite the old warning, people DO judge books by their covers and that's great for the indie author. We are all in the process of building our brands and name-recognition, so along the way, any way to get a reader to pick up our books is bonus. The authors keep a very large percentage of the sale. In-store sales are 98% (we keep a 2% transaction fee to cover those costs) and on-line its 80% ( we handle the orders and fulfillment for 20%). Thats more money in the hands of the authors. We don't deal with 3rd party distribution. All of our authors are also independent business people by default and so we works closely with the authors themselves. We are building more than just a bookstore, we are building a community of like-minded people who support each other. On a similar note, we offer a strength from a social media standpoint. With hundreds of authors in our store, all marketing for themselves, us and, essentially, the other indie authors, it is easier to create a bit of a buzz. Most importantly we are bridging that gap between indie author and their readers. When we have a book club read a book from our store, they can invite the author in for an in-person visit or we can Skype them in if the author isn't physically close. That isn't something that happens at a big box bookstore. Are certain genres particularly popular? It goes it cycles - due mainly by word of mouth from the authors themselves. If an zombie author like Shana Festa decides to take a shelf in the store, she shares with her author groups (many who write in the same genre) and, for a few days, we get a rush of interest from that genre. Then two days later we will get a rush of mysteries or thrillers for the same reason. Suffice it to say that there will be a little something for almost every reader imaginable. How do you curate your collection? Our basic selection process is pretty simple. Award-winning books are almost always pre-approved for inclusion in the store. We do check covers to make sure they look professional, read blurbs to make sure that subject matter is appropriate for us, and read reviews on Amazon and Goodreads. Once in the bookstore, it seems a given that the success or failure of a particular book will depend on a very similar process from the readers. How does an author based in Europe get their books to you in Florida? And how do they get paid? A lot of authors in countries other than the US, send us POD inventory through third party publishers like Create space (Amazon). The only way it would be easier is if I opened a P.J. Boox store right there in the UK! As for being paid, a majority of our authors are paid through Paypal even here in the US. Tell us a little about your plans for the future. Finally, what kind of books do you personally love to read? Since I was a kid, I have loved to read mysteries (from Encyclopedia Brown to Nancy Drew & Trixie Belden) and anything that made me try to solve a puzzle. Of course, I love children's picture books and am sometimes the only grown-up sitting on the floor in the kid's section of our local library without a toddler in tow. I enjoy memoirs of the famous, infamous and the extraordinary. The personal glimpses of people who lived through history and watching how either they were effected by historical events or created them is very interesting to me. At the start of the year, I made a personal challenge to read only indie books. My "to read" pile is, as you can imagine, huge at this moment! Editing is very much a marmite topic. Some writers love it. Others loathe it with a passion. Me, typically I am in the middle. The first round of editing, when I’m still on a buzz from finishing the first draft, is always a thrill. But by the time I’ve worked my way through feedback from a handful of beta readers and an over-zealous proofreader, I’m no longer quite so enthralled by the whole process! But as I’m always interested how other writers tackle the whole nuts-and-bolts process of writing a novel, I thought it might be interesting to pass on how I handle the editing process. After five published novels, and a sixth on its way, I’ve learned quite a lot about quality control. This is what I call my first initial read through upon completion. Lots of things can change throughout the novel. Characters that started the book with red hair may end up blonde. A twist that happened in Chapter 20, may affect a declaration made in your opening paragraph. So, I like to sit down and with the ending now forefront in my mind, read through the novel carefully – watching out for any bloopers that would spoil the whole integrity of your work. Once I’m sure I have the story in the right order, the beginning, middle and the end sorted, I make a list of individual chapters. I list the main protagonist for each, against content summary and word count. Doing this is also handy if I need to make changes as I’m editing, - it’s a quick reference guide to where I need to go back to. I have a set list of words I use the Find/Replace feature on Word to thin out to a bare minimum. On my list are just, had, that, felt, but … and and. Not all can be removed of course, but I’d put odds on a good 90% of them being redundant. As well as fillers I also do a Find/Replace for words I have an awful habit of repeating. On this list I have shuddered, swallowed, gazed, nodded. Again, I would say at least half can go or be replaced with something less tiresome and more original! Not something you can rely on any grammar check to find, but I always take time to search and destroy as many unneeded adverbs as I can. My pet hates are those used after dialogue tags - eg. he said loudly (so he shouted, right?) I use the rule - if you need an adverb, there's a chance you chose the wrong verb. 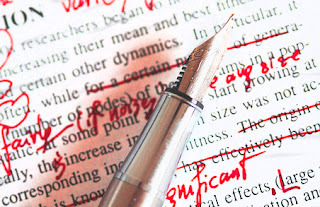 Adjectives too, whilst great if used to a bare minimum, can clog up descriptions and prose. Be ruthless and take your shears to both. This can be a killer, in any genre I imagine, but particularly in crime fiction. Even more so if you’ve made lots of changes in the book. This is another minefield, again crime fiction is a killer. Make yourself a list of questions that you used early on in the work to hook the reader, and content yourself that by the ending of the book all have been satisfactorily answered. Make sure Red Herrings work and aren’t too obvious. Ensure the ‘believability factor’ isn’t stretched past breaking point in any of your twists and reveals. Tie up loose ends and fill in gaping holes, and use this editorial process to ensure your story is tight. My own rule of thumb is that it’s okay for the character to use them if it’s needed to show character. But it’s not okay for the author to rely on them. So, do a run through and ensure originality. Quite obvious, but something that takes a fair amount of time and patience, especially when local dialect or dialogue play a large part of the book. Take your time, make sure you don’t miss anything obvious. There are some things you can’t rely on technology to sort out – typos are one of them. My biggest faux-pas is our/out. No one other than your own eagle eyes (or someone else’s) is going to sort this editing nightmare. So read each word, don’t skim, and see what should actually be there. This is crucial for me, especially in areas of dialogue, so I have a real feel for the interaction and rhythm. My rule of thumb when reading aloud is that if I stumble over a particular line more than twice, it has to go. Any line that creates a frown needs work. Perfect lines just flow in time with the beat of your writing, so try and make every line perfect. At this stage, I go over each chapter again and do a second word count, hopefully you’ll be amazed how many words you’ve shaved off your work. I try to keep my chapter lengths quite constant, within 1000 words of each other, so at this stage if chapter four is 3000 and chapter five is 8000 words, you may have some rejigging to do. It’s always worth at this stage, having a final run through of chapter numbers and headings. With all the changes, it’s quite common for me to find I have two chapter twenty sevens, and no twenty eight. I think it’s always a good idea to reread the story again at this stage. Clear your head of all of the hours of agony that have come before, and read this time as a reader, not a writer. Hopefully, you will actually forget you’ve written it and enjoy the story, or find yourself smiling with pride at your talent. And now you’re ready to set your baby free, send it out into the big, wide world, so new eyes can read it for the very first time. At this stage, don’t be tempted to fiddle or faff – walk away and leave it alone. If you use beta readers or proofreaders, you know they are going to find you more work, and that’s when your job is to give the book one final super-polish, so it enters the world of publication as perfect and polished as a diamond. One you can be very proud of indeed. 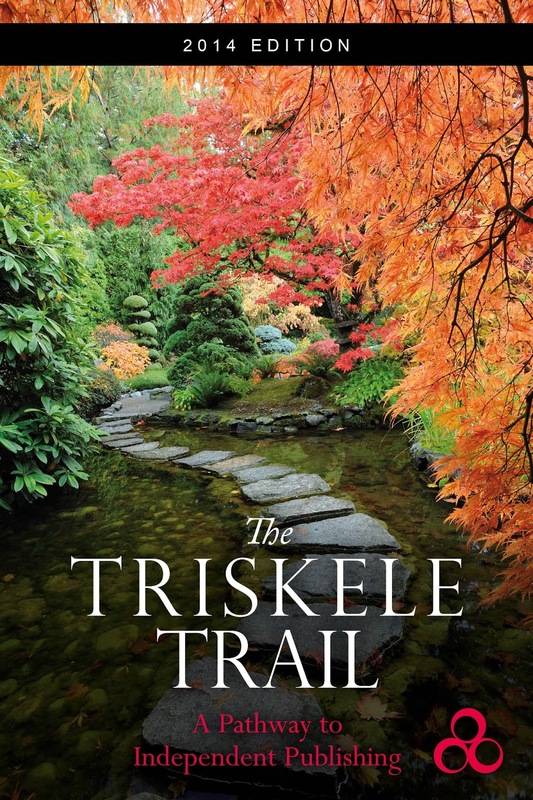 For more helpful tips and advice, check out The Triskele Trail. Practically the only thing I knew about WattPad before I decided to dip my toe in its waters was that the redoubtable Margaret Atwood – my Canadian literary hero – was a member and a strong exponent. The fact that she championed it was enough to make me want to explore further. WattPad, like GoodReads, is a social media site where readers can interact with writers. The big advantage of WattPad is that it has a big membership of young readers, all hungry to find something else to read. And while Goodreads allows readers to review published books, WattPad allows readers to participate in the creative process. In many ways, WattPad recreates for a digital age the old idea of a novel serialised – as many of Dickens’ were – in a newspaper. Author members of WattPad post extracts of their work on the site and encourage readers to follow along with them, commenting as they go, and even perhaps changing the outcome the story through their input. 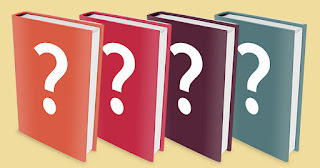 Authors can in theory post in just about any genre, but given the demographic of the readers, by far the most popular genre, and therefore those most likely to attract a big following, are SciFi, Fantasy and Young Adult. So how do you go about taking your first steps on WattPad? Start by setting up an account (user name, email and password). Then you can add an avatar and background image, and write a bit about yourself in your profile. As with any social media site, it is only polite to ‘give’ as well as ‘take’, so your next step should be to look around for people to follow. Find some authors working in genres you are interested in and follow them. Look for a some who have a big following to see how they operate, but also pick a few new to the site with a smaller following who will appreciate the support. Once you have explored a little, read a few things on offer, made some comments, it’s time to start posting things of your own. The recommended approach is to post a chapter at a time (<2k words preferred), and to do so regularly, at the same time each week (say midday on Friday). So it is ideal if you have one or more books with good drafts complete, but on which you would still welcome feedback. Or if you are part-way through something that is really flowing well and you can be fairly sure of being able to keep up the pace. Posting is dead easy. You just drop text into the box available. One of the best things about WattPad is that there is no competition and no ‘scoring’ of books. If readers find you, they will read and comment, and you are encouraged to interact with them. You are at liberty, and even encouraged, to add links to where people can buy completed books. And the word is that some at least will buy the book if they have loved your writing. But it is in essence somewhere people can read for free. So if you are after building up a readership, and you have the right sort of books to offer, this could be the place for you.